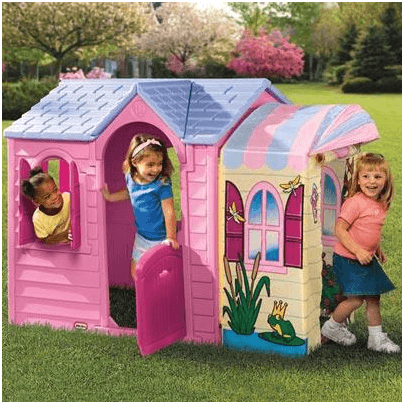 Looking for a Little Tikes princess garden playhouse? 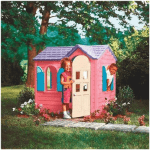 The Little Tike Princess Garden Playhouse brings the opportunity to live like a princess in their very own princess house. 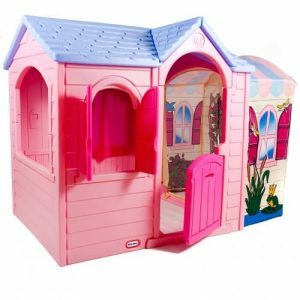 This stylish playhouse with a perfectly pink colour scheme will please any little girl with aspirations of being a princess. Little girls everywhere will be over the moon with this beautiful Princess style garden playhouse. In the most beautiful pastel colours and with a Dutch door and window with shutters features it really is a stunning piece where your daughter or granddaughter can act out her very own fairy-tale. It is made of UV resistant plastic so will retain its good looks. There is even a small extension with a canopy. Suitable for little girls everywhere age 2+. Combine the words ‘princess’ and ‘playhouse’ and girls from across the land will come flocking, and with this playhouse it’s easy to see why. When you see this playhouse you think to yourself, what more could you want from a little girls playhouse? With its canopy extension providing a unique feature and it’s aesthetically pleasing appearance, this playhouse is the perfect fairy-tale residence for every princess out there. At the mid-range price point, this house provides fantastic value for money. 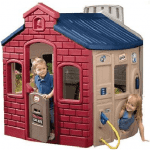 Little Tikes Princess Garden Playhouse: How safe is it? 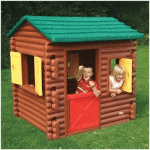 The Little Tikes range of playhouses are renowned for being sturdy and built to last and this playhouse is certainly no exception. However, with all the extra features that make up this particular model, the team at whatshed.co.uk examine and discuss and potential safety issues that may be of concern. Below we look in detail at the various features and fittings of the playhouse to see whether there are any safety concerns that parents need to be aware of before purchasing. Windows: The windows have lovely shutter style that curious children can enjoy opening and closing, whilst seeing who has come to visit them. The in-built handles ensure that children operate the windows in the correct way, avoiding any chance of trapped fingers. Door: The door is a stable door design which is chunky and rounded, with no sharp edges to be seen. It can be opened from the top or using the in-built handle provided, again avoiding any chance of fingers becoming trapped during play. Extension/canopy: The extension with canopy feature is made of a different and thinner type of plastic than the rest of the house. As it is just a walk-through extension and way of entering and exiting the playhouse, there is no real concern about it not being sturdy enough for use. The only concern may be if the child pushed against it, but being securely fixed to the main house this causes really is a very minor issue. 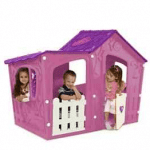 Little Tikes Princess Garden Playhouse: How easy to build? Out of all our playhouses we have available to purchase, are no doubt the easiest to build and put together. It doesn’t matter if you’ve never built anything in your life, let alone a playhouse, you will put this together with ease. Little Tikes use very simple click and build technology, meaning that all the pieces simple click together. No screws, no tightening, no tools at all required, putting this playhouse together is literally child’s play. If you do come stuck at any point, it comes with a easy-to-follow instruction manual in several languages. 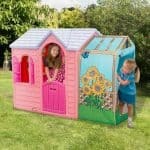 Little Tikes Princess Garden Playhouse: What is the overall quality like? The Little Tikes range combines quality with personality and unique designs. This playhouse is a combination of a traditional Little Tikes playhouse with the added canopy extension for extra whimsical fun. Little Tikes is renowned for its sturdy, solid construction that will last for many years to come. The UV resistant coating will ensure that the pink colours stay vibrant and princess-like for the life of the house. The canopy extension, although made of a slightly flimsier plastic will provide many hours of fun, and brings a unique feature to this particular model. There is a probability that this section may not withstand the same amount of use as the main house, but for the time your child is using it, with a bit of care it will no doubt hold its own. 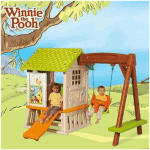 Overall, a high quality, stylish playhouse that will endure the harshest weathers and rough and tumble play. In true princess pastel colours, this playhouse would be a little girls dream house. The design makes it feel like a magical castle and provides opportunity for endless hours of imaginative play. At the lower end of the mid-range price point, this playhouse provides excellent value for money with the added extra of the pretty canopy extension. Overall, a real winner and fantastic addition to your little girls princess collection. Which girl doesn’t like to be called a princess? Well, my granddaughter surely thinks herself and calls herself a princess after I got her this for Christmas. The playhouse is as easy as a breeze to assemble. Although the price is very cheap, the material used to make it is in no way cheap. The plastic used is UV protected, hence the vibrant colours of the house will always remain as it is no matter how long you keep it in the sun for your ‘princess’ to play with. The size is somewhat acceptable but for the time being the playhouse is big and spacious enough for my granddaughter to play with. I would advise everyone to buy this to make his or her little girl feel like a princess!